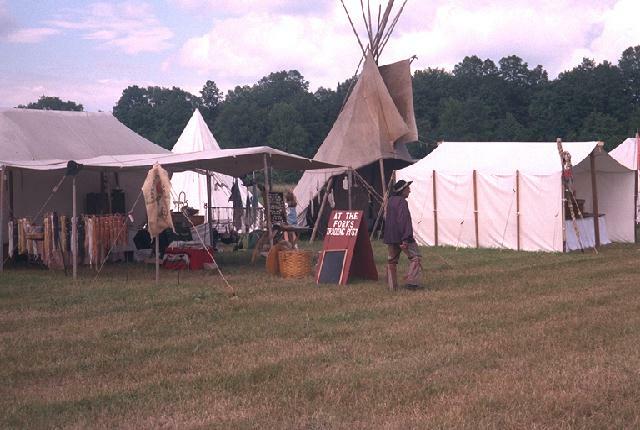 Fort bon Secour (Pike Lake, WI), July 1996. 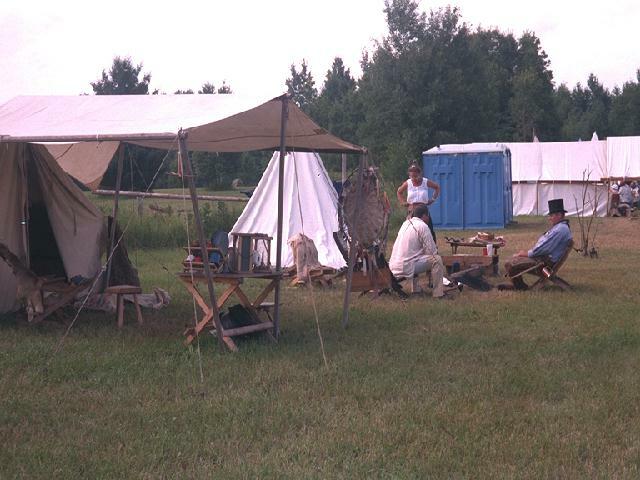 Our camp at the Firecracker Rendezvous. 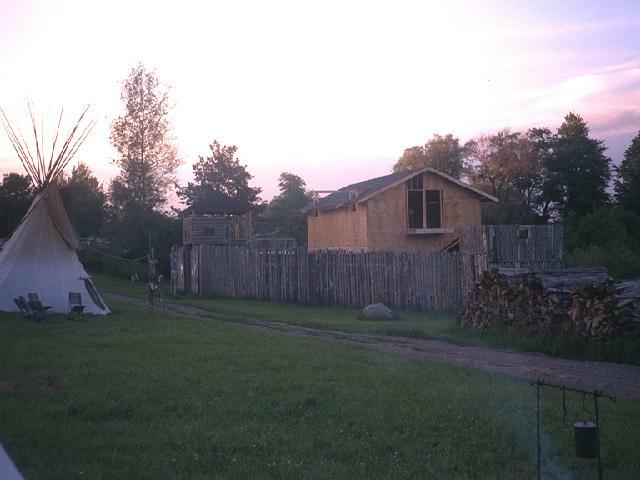 Fort bon Secour (Pike Lake, WI), July 1996. As you can see, the fort itself was still under construction, but coming along nicely. In between Rendezvous, Father Thomas opens it up for School Groups, Scout Troops, etc. 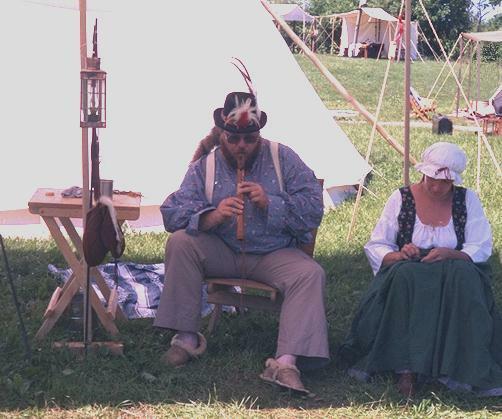 He and his group run it like a Living History Museum in the hopes of educating Flatlanders. Mid-Continental (Lady Smith, WI), July 1996. These were some of our nieghbors at Lady Smith. They got there real early to get this spot. I doubt it was to be close to the hooters. More likely it was to be next to the gate (which is between them and the hooters), so they got first crack at the Flatlanders (while their wallets were still full!). near sunset of the first set-up day. (So, please ignore the strange " covered wagon" on the right side). 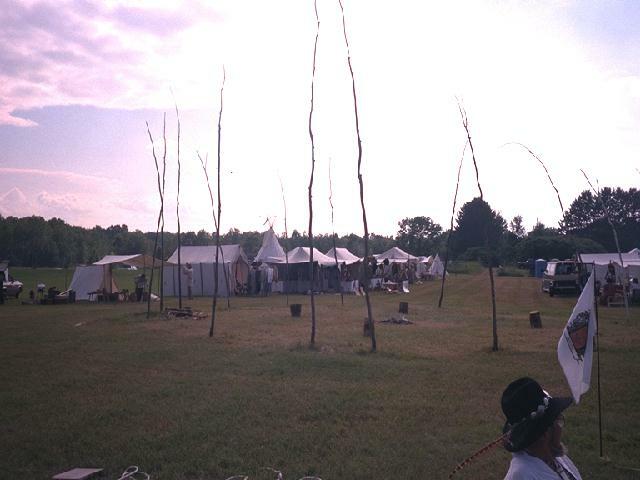 Our Tipi is the tall one, just left of center. 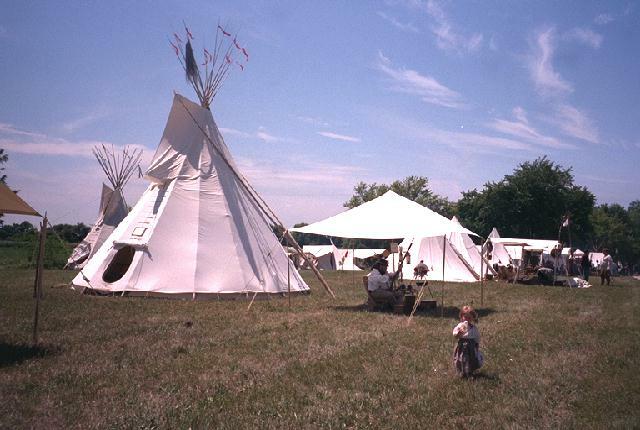 Ours is usually the biggest Tipi wherever we go. I didn't plan it that way, but it works out kinda nice - it's easy for people to find us. Mid-Continental (Lady Smith, WI), July 1996. The North side of Traders row. It's still first set up day, so it's a bit empty yet. Mid-Continental (Lady Smith, WI), July 1996. The South side of Traders row. Again, it's a little empty yet. 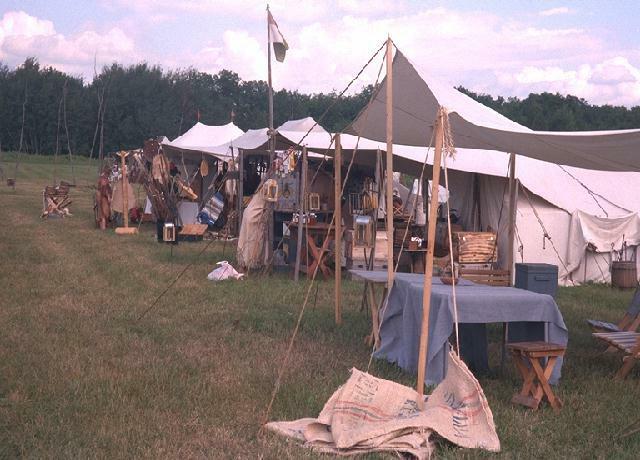 But this side filled up faster, probably so their wares would be more in the shade. Frenchman's Frolic (Rockford, IL), August 1996. Frenchman's Frolic is a "Rendezvous-ers Rendezvous". They don't turn away flatlanders, but they don't work too hard to round them up either. It's mostly just a chance for Skinners to relax and have fun. The little one in the foreground is my youngest, Dorothea. She attended her first event (in garb!) at the ripe old age of 3 weeks! 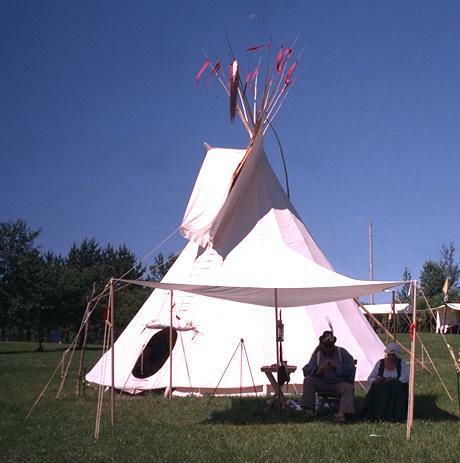 To her, that Tipi is home and our house is just where we stay in between events. 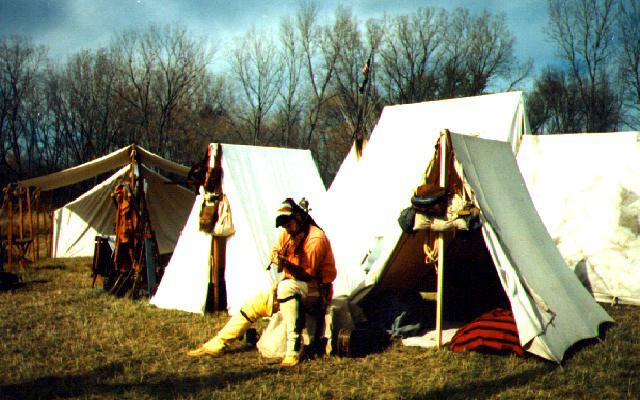 Trail of History (McHenry, IL), October 1996. The Trail of History (A.K.A. The Kames) is a good sized event (300+ lodges and more wanting in every year). But oddly enough, it is not very well known. Maybe it's because they are very strict about the rules. Once you set up, they expect you to stay in costume and in character all of the time. Now a lot of Rendezvous say this, but Trail takes it to the point of not wanting you to smoke store bought cigarettes or drink your beverages from the original containers - even after hours, when there are no flatlanders in camp. It was hard, and yet rewarding, to stay within all of their rules. And I think I'll do it again this year. 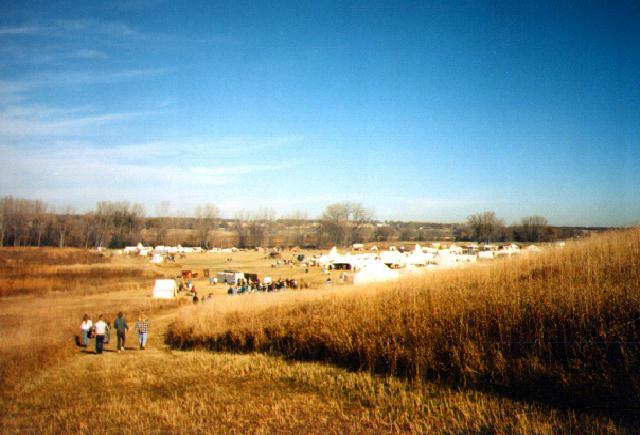 Trail of History (McHenry, IL), October 1996. A fellow Skinner, tuning up his fiddle. We had a wedding there this year (a real one, not just a show for the flatlanders). There was lots of dancin' and singin', with plenty of music provided by the participants. This fellow was just one of the dozen or more musicians who serenaded the happy couple.